"ad libitum, ad nauseam, ad eternam"
Cellist Paul Dwyer brings to life everything from early music on baroque cello to brand new works by young composers. He has been prize-winner of numerous competitions, and is the recipient of the Javits Fellowship and Presser Award. He has worked with composers such as Saariaho, Hodkinson, Bolcom and Sheng, and has performed chamber music with pianist Menahem Pressler, principal players of Apollo’s Fire, and artist-faculty at the Aspen Music Festival. As a Fulbright Fellow, Paul studied privately with Anner Bylsma and Frances-Marie Uitti in Amsterdam. Paul grew up in Vienna and Munich before attending Oberlin Conservatory and the University of Michigan. 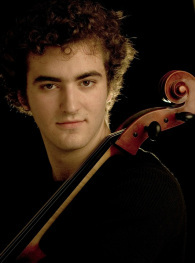 He is currently pursuing additional graduate studies in historical performance at The Juilliard School.